Comparisons to Zombies!!! 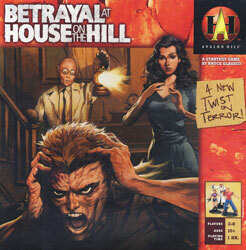 and other (mostly Twilight Encounters, Inc.-related games) are inevitable, but if you’re looking for a horror game, Betrayal at House on the Hill at least compares favorably. The object of the game is to be the first person or team to achieve their objectives. Does that mean it’s a team game? Well, yes and no. You start out as a single party, each player using his own character to comb through the old mansion in search of equipment and clues that will help you beat the haunted home in which you find yourselves trapped. Somewhere along the way, though, the evil that dwells here is going to reach a critical mass, and when it does it will pervert one of the hunters. From that point, the traitor has to do in his companions (or bring about an apocalypse that will do the dirty work for him, or…), and the survivors (up to this point, anyhoo) have to stop his dastardly plans or at least get the front door open. 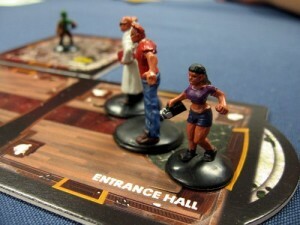 The game starts in a long hallway that recalls the Bates Motel, with doors and stairs and such leading off in all directions. Everyone gets a figurine that depicts their in-game persona, and these move through new and unexplored passages that turn up new rooms, areas, and transit points. (There are six character pieces to play, but in a clever little move each one is two-sided and the illustrations just vague enough that they all pull double duty, giving you different people with different skills to work with and keep things fresh). The rooms are all on tiles, thick cardstock pieces blindly flipped up from a deck to create a new layout for each game. Rooms may provide new items or even companions, but it’s also a good bet you’ll stumble over threats and challenges. Each trial is compared to one of your statistics, and you roll dice equal to that stat. The six-sided dice are different, having zero, one, or two pips per side to get your totals. Succeed and you may get new goods, card draws, or perhaps just safe passage. Some rooms, though, provide the dreaded omens. Omens aren’t bad in their effects – not at first, in any case – but when one of these is drawn, rolling less than the current number of omen cards in play turns someone at random into a traitor and the endgame is underway. You may become (or have to stop) the zombie lord, for example, or have to fight/control a swarm of rats. Both sides look into their booklet – one for the bad guy, one for the heroes’ team – and see what the code tells you to do in order to see daylight or bring about the darkness. There are 50 different stories, so you won’t run out too quickly. It’s another of those pricey new Avalon Hill boxed sets, but the components are plentiful and all top-notch. The figurines are way nifty, the card stock and illustrations clean and crisp, and the box even has little cardboard separators that form “pockets” inside the box to store bits and pieces (assuming you don’t need someone to point this function out to you…ahem). There’s an awful lot of punching out for the buyer to do, so be ready to do a bit of grunt work when you first crack the cover. The characters have a little disk that shows their skill sets, and small plastic sliders are used to record these. They can go up or down in the course of a game, and eventually the friction of all these changes may wear down the graphics (with a few uses it doesn’t seem to do a lot of damage). While it’s tough to create a really horrific atmosphere just sitting around a table, House on the Hill makes a gutsy effort. The cards are written to be read aloud, making the players narrate their adventures with creepy dialogue. The omens are spooky, there are creepy little graphics (do you really want to know what made all those little scratches? ), and the cards make reference to each other in clever ways that make it all that much more surreal. It’s not really a new idea, or a terribly original execution, but Betrayal at House on the Hill is a well-made, handsome boxed set with a good bit of replay value, and is at least as worthy as its competitors for the gamers’ dollars. To tell the truth, I am voiceless. The Shawshank Redemption is tremendous. I am a young movie fanatic, as a matter of fact, this movie come out whenI was very young, and hence I am more used to films with marvellous special effects, edge-of-your-seat action, et cetera. This movie has none of that, and even, it really much . The way Frank Darabont applies the tale of Red to drive on the story, the beauty of the soundtrack used (note the mouth harp used merely earlier Red receiving the letter close to the end). The whole movie, from beginning to closing, from actions to music, is a beacon of hope, judgment, and redemption. The cast is ideal, Morgan Freeman(Red) in reality brings about a refreshing feel to the film, and that’s exactly what the film is, what a film should be. Really recommended for every movie fan.